With rapid five-minute presentations, accompanied by 20 slides ticking down at 15-second intervals (similar to the very popular Nerd Night format), Ignite Phnom Penh hopes to inspire with ingenuity, humour, imagination, and ideas that are a call to action. 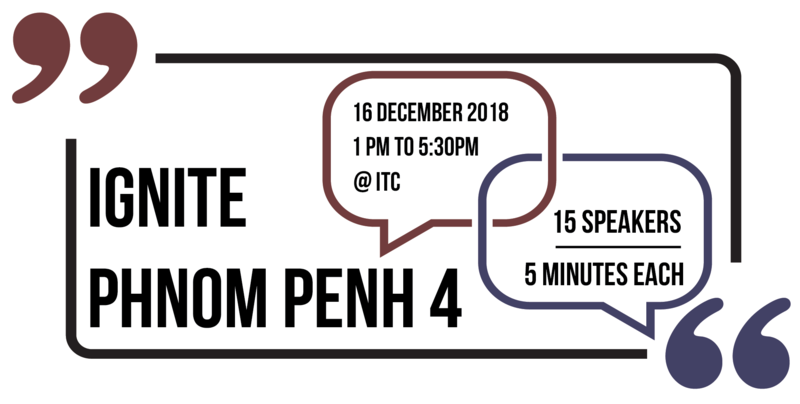 Organised in Cambodia by social enterprise Outsources International, Ignite Phnom Penh 4 is part of five Ignite events that will take place in the Kingdom in the next year in Battambang, Zaman University, Siem Reap, and Phnom Penh. Ignite, a movement started in Seattle in 2006 with the motto of “Everyone Speaks” is built on the belief that public speaking builds confidence in individuals and that events can build community. From humble beginnings it has since expanded and was brought to Cambodia in 2016, hoping to make it possible for anyone, anywhere, to learn to present their ideas and their stories. For more information on Ignite Phnom Penh 4, check out their website HERE. Get your tickets to the event at the Institute of Technology of Cambodia HERE! Here is a list of speakers and the topics presented, topics are in either English or Khmer.